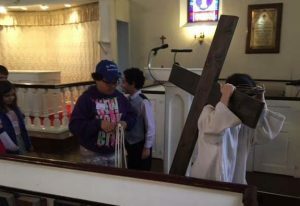 St. Peter’s Church is hosting a special ecumenical Good Friday service and program designed specifically for families and children. The service is called “A Walk Through Holy Week” that allows young people to experience the drama of the Passion from Palm Sunday through Maundy Thursday and the Last Supper, the Agony in the Garden, Jesus’ Trial and the Crucifixion in an ecumenical service consisting of participatory scenes by all those in attendance. Parents can drop off children beginning at 10:00 a.m. The service begins at 11:00 a.m. to be followed by lunch in the parish hall for everyone at noon. Following lunch, the the movie A Dog’s Way Home will be aired in the parish hall. The central lesson of this story focuses on love. 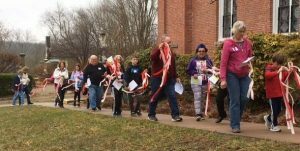 And in a sense, the kind of love we see expressed here always centers around caring for the weak and adopting them into your “family.” After the movie we will design Easter cards to be sent to residents of Colebrook Village retirement community. Invitations have been sent to area churches, and others youth organizations. There is no cost for the day or lunch. We encourage RSVPs for groups by calling 860-228-3244.